This family ancestor gave me a bit of a hard time tracing back his lineage. His descendants went by the name of Cinq Mars. Abraham however was born as St. Mars; he married as Guillet dit St. Mars and his death is recorded as Cinq Mars. Abraham the son of Joseph Guillet dit St. Mars (2) and Brigitte L'Heureux was born on January 30th 1799 in the parish of St Francois Xavier of Batiscan, on the north shore of the St Lawrence River. His father passed away on February 27th 1802. Abraham was only two years old! The following year, his mother remarried on September 5th. Her new husband and the only father Abraham ever knew was Antoine Lemay dit Poudrier. He was a widower from Lotbinière across the St. Lawrence. On January 28th 1823, Abraham married Marie Gouin. She was the daughter of Joseph and Victoire Lefebvre. (Her ancestor was Mathurin Gouin from the Poitou region of France who arrived in the New World in 1657). 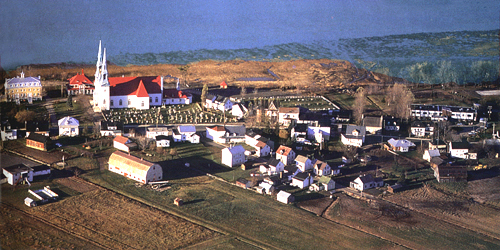 Abraham and Marie's first children were baptized in Batiscan. 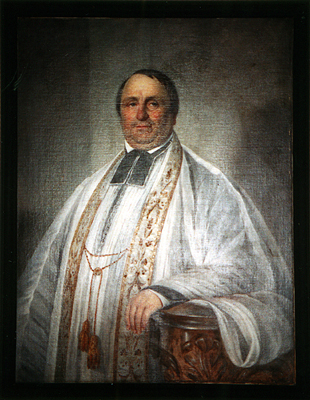 Aimé Guillet dit St Marc, the first child, was specifically baptized in Ste Geneviève de Batiscan; on the baptismal record it states " Abraham Guillet dit St Marc cultivateur en la paroisse St Francois Xavier de Batiscan". Their next three children, Onésime, Dulis and Marie Ulysse were baptized in the parish of St. Francois Xavier. From 1829 through 1835, four of his children ( Sabin, Abraham Eusèbe, Francois-Xavier, Ephrem) were baptized in Ste Geneviève. I'm not sure if he'd moved. Ste Geneviève became a parish in 1727 so it's not a case of a new parish forming and without moving he now simply belonged to the new church. 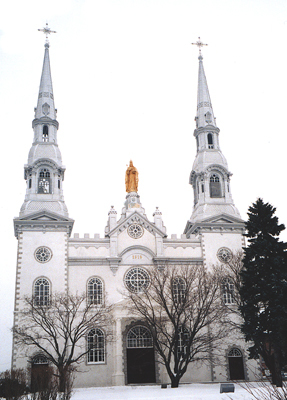 In 1836, however, he had definitely moved across the St Lawrence river to St Louis de Lotbinière, for his daughter Sophie was baptized here on May 6th. As a child, I imagine he had visited Lotbiniere with his stepfather. He probably knew the place well. The rest of Abraham's family were born here through 1847. Abraham and Marie had 13 children: 7 boys and 6 girls. I sometimes get the impression Abraham was a jack of all trades . On various baptismal records, I have found his occupation listed as menusier (a carpenter), cardeur de laine (wool carder - uses a comb - like instrument to prepare wool) and a cultivateur (farmer). With the notary, de Villiers, practicing in the Lotbinière region in the mid 19th century, Abraham Cinq Mars is mentioned in connection with a donation on June 1, 1850. The Quebec Cencus of 1861 says Abraham is a "menusier". He is 62 years old. Residing with him are his wife, Marie Gouin 55 and three others: Sophie Cinq Mars 23 years old, Andronique Cinq Mars 14 and in school and Virginie 16, also in school. The cencus of 1871 gives Abraham's age as 72, Marie Gouin 65, Andronique is 23 and a clerk; Sophie is 32. We have not yet found out where Abraham and his family resided in Saint Louis de Lotbinière. His grandson, Charles had land to the west of the village. The house that Charles and his wife, Athanais lived in is on the main road going into the village. The address today is 7726 Marie Victorien. The present property papers state that the land comprises lot numbers 49ptie and 50ptie. Earlier, the property was subdivided into parts; lots 49 and 50 had a southern and northern part. The house is on the northern section, above the cliffs near the St Lawrence river. A road goes down the cliffs to the river's edge. There one finds the southern part. There is some land here that stretches from the base of the cliffs to the water. The original property was about 1-2 arpens wide. Sounds like the original land that Charles had at the turn of the 20th century was the standard 2 x 40 arpens. Was this Abraham's original concession? 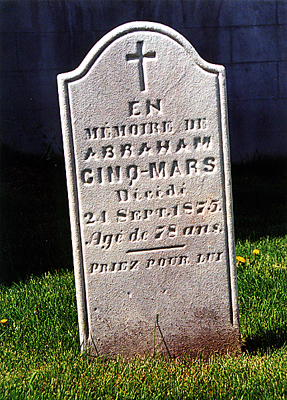 Abraham Cinq Mars passed away on September 26th 1875. According to the parish register he was 77 years old. His tombstone, pictured at the top of this page, is in great condition. It is located right beside the church on the protected side, away from the cliffs overlooking the Saint Lawrence River.